The stuffing for these giant mushroom appetizers looks and tastes like crab cakes. Budget-minded cooks can use imitation crab. 1 of 5 Heat broiler. Mix scallion, pepper, thyme, tarragon, mayonnaise, Parmesan, salt, pepper sauce in bowl. Stir in crabmeat, so it remains lumpy. Cover; refrigerate. 2 of 5 Remove mushroom stems; scrape out dark underside. Brush both sides with oil; season with remaining salt, pepper. Place on broiler-pan rack. 3 of 5 Broil mushrooms 2 minutes each side. Remove from broiler; let cool slightly. 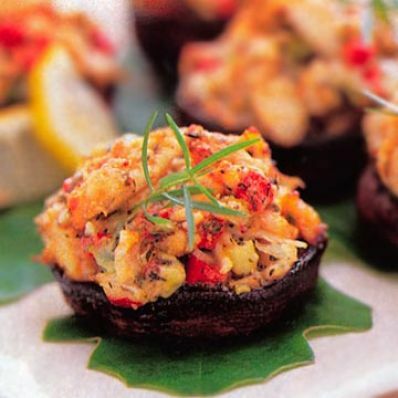 Reduce temperature to 375 degrees F.
4 of 5 Fill each mushroom with 1/3 cup crabmeat mixture. Sprinkle each with remaining 1 tablespoon Parmesan cheese; sprinkle with paprika. 5 of 5 Bake in 375 degree F oven 15 minutes, until slightly browned and bubbly. Makes 6 servings.